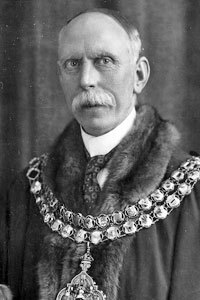 First Labour Mayor of Bolton. Became an office boy in the Parks Superintendent's Office at 14, and later a member of the outdoor staff, remaining with the Parks Department for 20 years. He worked 15 years during the winter as a stoker at the Corporation Gas Works. Became full time Permanent Secretary of Bolton and District Gas Workers Association aged 35. Represented East Ward from 1909. Alderman 1922. His early years with the Parks Department made him a keen botanist and horticulturist. His wife, Lily, was Mayoress. 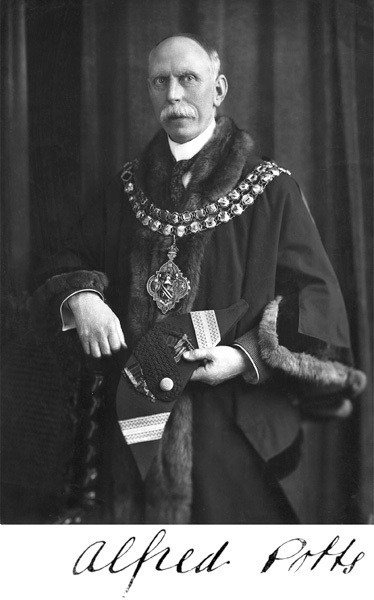 Formal portrait of Alfred Potts as Mayor of Bolton. 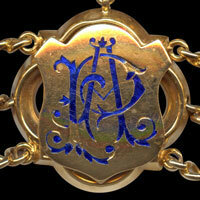 Alfred Potts' link on the Mayor of Bolton's Chain of Office.